Many relationships start out blissful. All too quickly, however, that bliss can turn into apathy or even animosity. I’m not talking about romantic relationships. I’m talking about relationships between clients and their agencies. It most often happens like this: Prospective client meets agency; prospect falls for agency; prospect becomes a client; client feels abandoned; client leaves agency. Why is this cycle so prevalent in the marketing industry? And what are the warning signs that your relationship may be doomed? There are a few key tells that can signal a breakup. If you’re a client, ask yourself the below questions. If you answer “no” to one or more, it’s likely these scenarios are impacting your ability to move your marketing communications initiatives forward, and it may be time for you to look for a new match. 1. Do you trust your team? – The number one reason clients stick with their agencies is trust. Trust to keep their business goals in mind, trust to execute in a way that maps to the business’s core values and trust that the work being done adds value. Ask yourself, “Does my agency have my back?” If the answer is no, or I don’t know, it’s time to dig in and find out why. Your agency should serve as an extension of your own team, which means anticipating challenges, opportunities and posing questions with a focus on solutions. If that’s not happening, then trust is likely compromised or absent. 2. Does your agency push you to take risks? – Anyone can say “yes.” But saying simply yes all the time and doing the status quo aren’t going to move your business forward. When is the last time your agency pushed you to take a calculated risk? There is a difference between getting close to the edge to have the best view and falling off the edge. I’m talking about the former. Having spirited dialogue around new ideas rooted in sound strategy is part of growth. Make sure your agency knows the expectation is not just mastering tasks, but thinking outside of the things you see and hear inside your company walls. That outside-in perspective is critical to avoid group think, and that is one of the major values of an outside agency. Is yours delivering on that promise? 3. Is senior level management involved in your account? Ah, the classic tale of the bait and switch. During courtship, many agencies put their most senior leadership on the pitch team because it is just that to them, a pitch that needs to be won. After the pitch is done and the contract is signed, where do these senior leaders go? Do you hear from them? Do they attend your meetings or events? Be clear during the courtship process about the expected level of senior engagement and make sure the agency is aligned. If it’s a quarterly strategy session with the Senior VP of Client Services, that may be appropriate. But if you require more frequent touchpoints given the volatility of your industry, or the investment of time and money by your own C-suite, then set that expectation and hold your agency accountable. 4. Is your team responsive? Your business moves fast, and so should your agency. If you feel like you send emails into an abyss or have a better relationship with your day-to-day contact’s voice mail greeting, take that as a major sign it’s time to part ways. Set up mutually agreed upon response times and be on the same page. It should go without saying, but sometimes clear expectation setting is the only way to ensure two-way communication. Do you have recurring touchpoints throughout the week? Is your agency mindful of your time and astute enough to know when an email update can do in lieu of a call given all the priorities on your plate? Being nimble, responsive and proactive is the key to success. Don’t settle for less. A good agency will tell you where service levels are month to month, can scale accordingly and won’t be afraid to talk about potential budget implications. 5. Is the chemistry still there? It may sound cliché but chemistry is very important. Do you have high turnover on your account? Do you feel talked at and reported to versus engaged in actual dialogue? Does your agency share ideas and insights with you? Do you enjoy meetings with them? Does your agency get you, your business and the challenges you face each day? If the answer is no, then it’s time to rip the band-aid off. Don’t settle. You’re better than that. Evaluating your agency partnership is a healthy thing to do, especially as trends in content marketing and communications are consistently changing how brands need to engage with critical audiences. 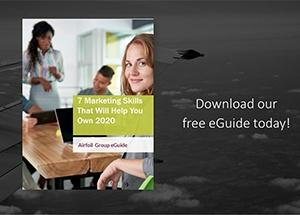 Check out some of the trends we see impacting the 2020 Marketer by downloading our free eGuide.